No, not Thomas ! 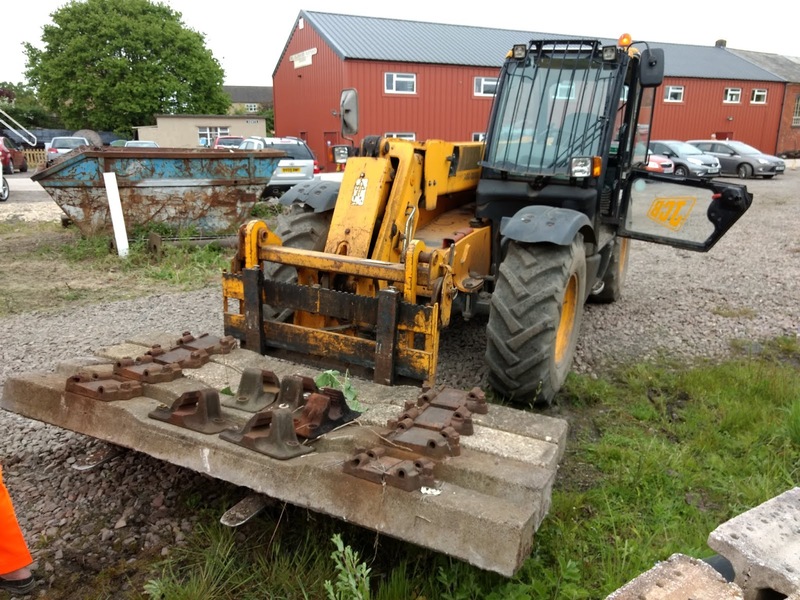 We are a serious railway, we got some heavy metal in. You'll see in a minute. But first, the regular work. 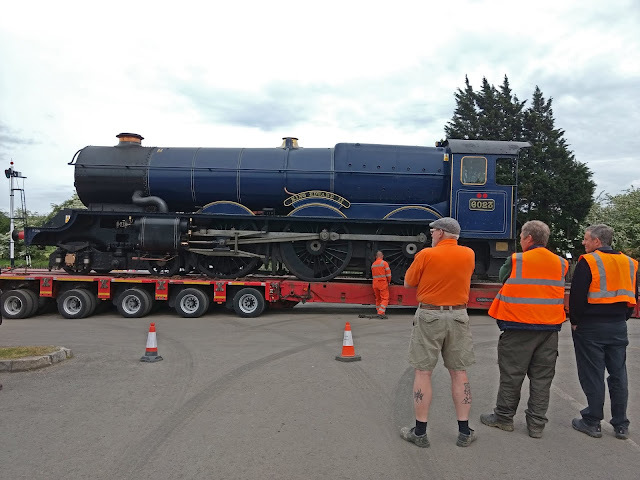 It took all day for the engine to arrive from the SVR anyway. And there was bad news to stomach straight away - the water for the tea had run out. Oh no! 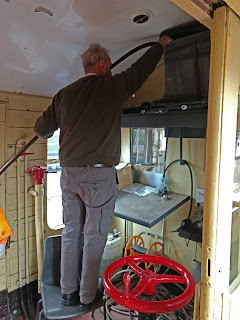 To boil water in the mess coach (not static, but an item of rolling stock) we need a supply in the header tank, and the panic every time is where do we get it from. Today a long hose was found and here Paul can be seen filling said header tank with the precious liquid, without which we can't boil the kettle. Tea needs several vital constituent parts for it to arrive in your mug: Water, gas in the bottle below, and milk, which has to be brought in fresh every working day. Oh yes, and doughnuts. We had lemon curd ones today, we recommend ! After consumption of tea and a doughnut (I say 'a' but this may represent more than one in some cases), it was straight to work lifting heavy stuff. 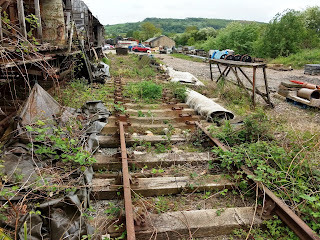 Here the Permaquip trolley needs to go back to Winchcombe to the PWay yard there. We heaved it on board the Landie, luckily it splits into two heavy halves, then the teams separated for their respective allotted tasks for the day. 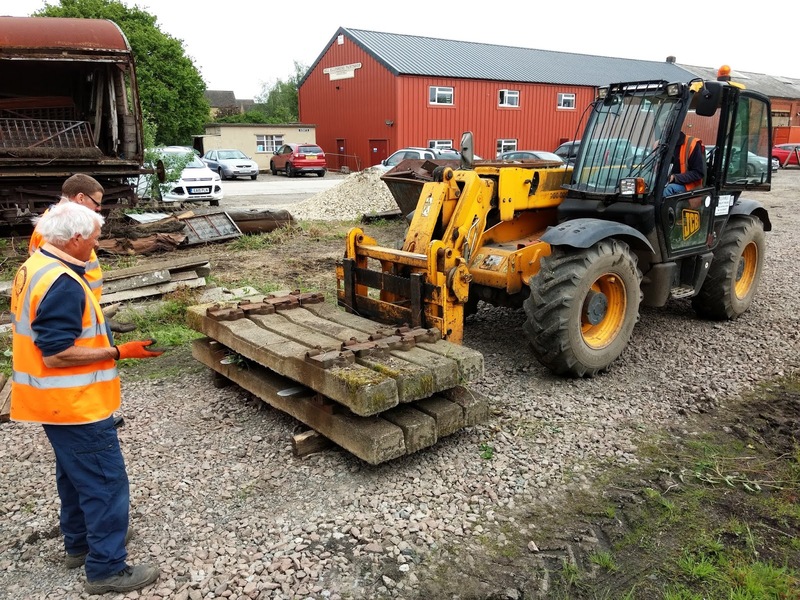 One team worked at Toddington by the two new turnouts, taking the chairs off the throughbolt sleepers removed to be replaced by the turnouts. 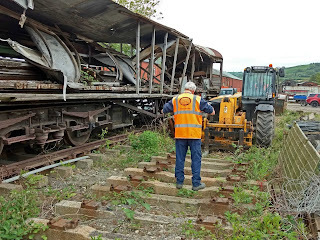 It was a slow job as it turned out, as there were rail disk cutter issues which let the side down. But quite a few got done during the day, the site is tidier, and 2807 have some more GWR type chairs to work with. 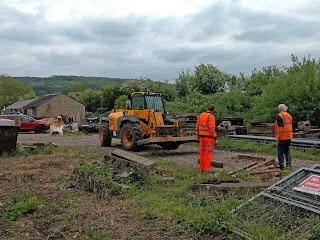 The other team went to Winchcombe to take up the concrete sleepers remaining from the temporary siding next to the two wrecked coaches there. 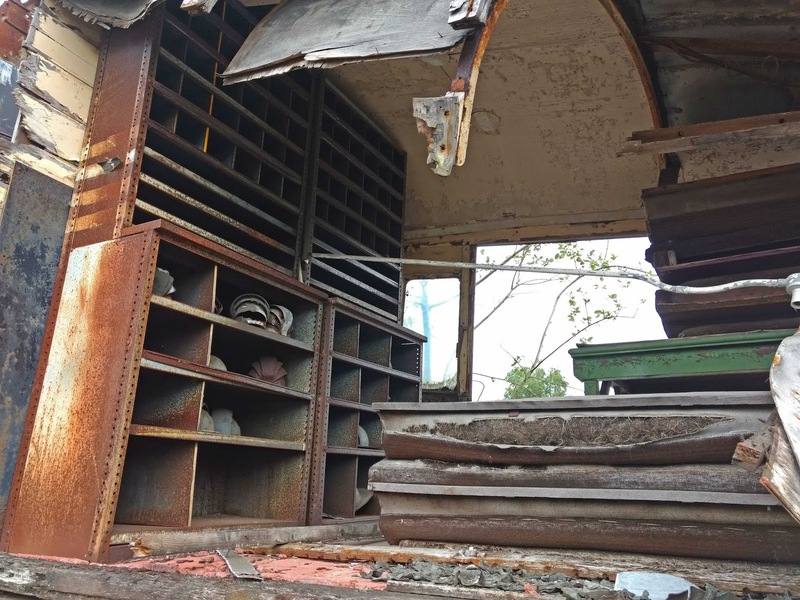 The recovered sleepers needed to be stacked somewhere, like here. But there are 4 lamp post in the way. 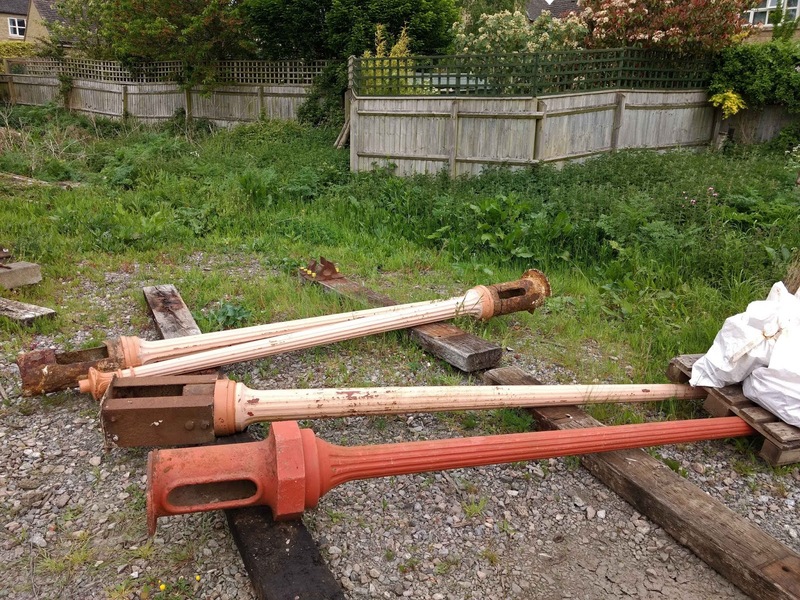 They are cast iron street lamp posts, once planted at Broadway in a fit of impecunious enthusiasm, but since replaced by precise GWR replicas. They are for sale, so if you want one, let us know. We have 7 of them in total. 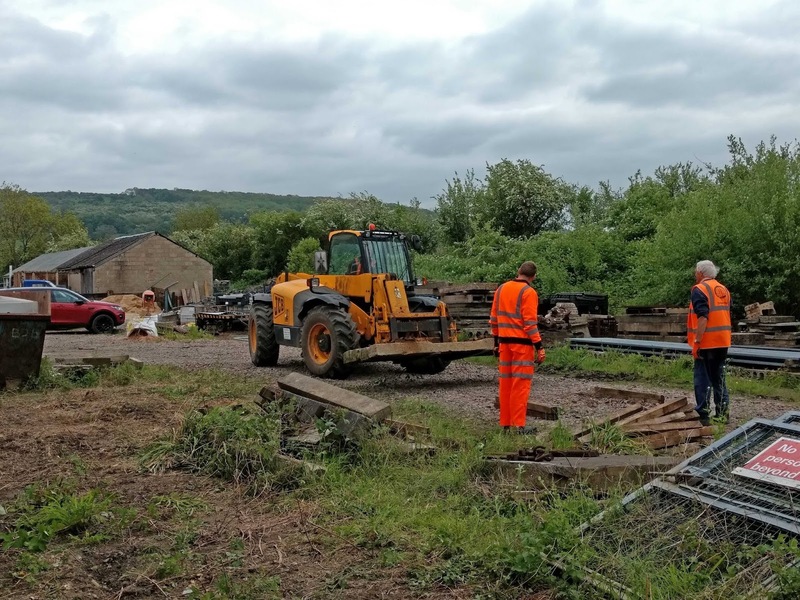 This was our place of work for the day, the sleepers remaining after the rails had been lifted from one of 3 unconnected sidings at Winchcombe that held stock belonging to a third party. 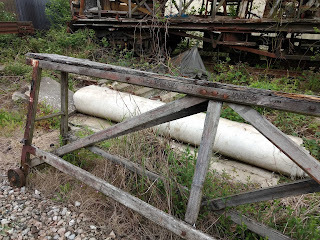 The centre siding is still there, and holds two very decayed carriages. You're going to ask, what are they then, so here are two pictures of them. Note that they do not belong to the railway, so we are not responsible for their restoration, if any. They do look pretty far gone. They are due to be collected by their owner for storage at another site. Here are some close up shots of the interiors. There are no sides, and the roof has largely collapsed as a result. No doubt a reader can add a bit of colour to theses bare observations. 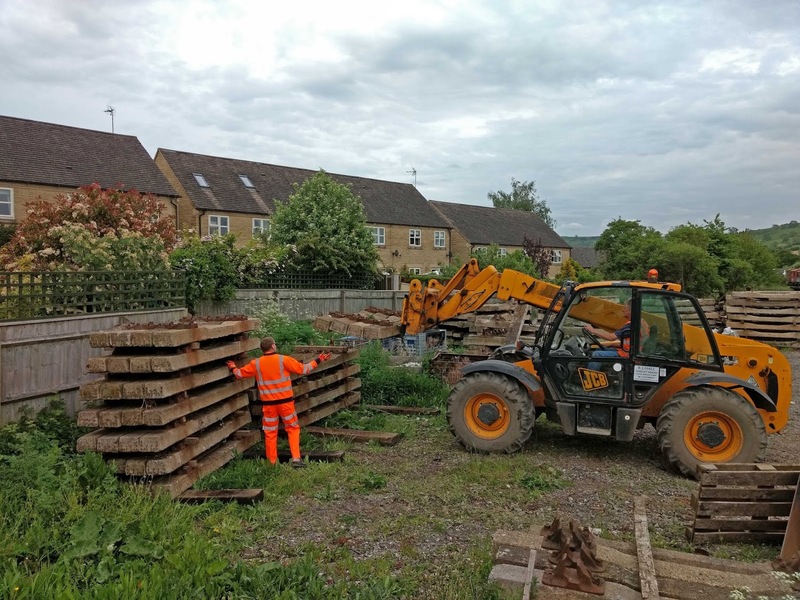 Dave came in with the Telehandler and started gathering up the sleepers in groups of 4. 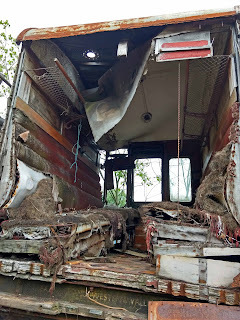 It was a tricky manoeuvre to get them out, without wiping out the few remaining roof supports of the coach alongside. The supports you can see here are temporary, but even they are showing signs of age. We took the sleepers on to the roadway and made stacks of 8 of them. 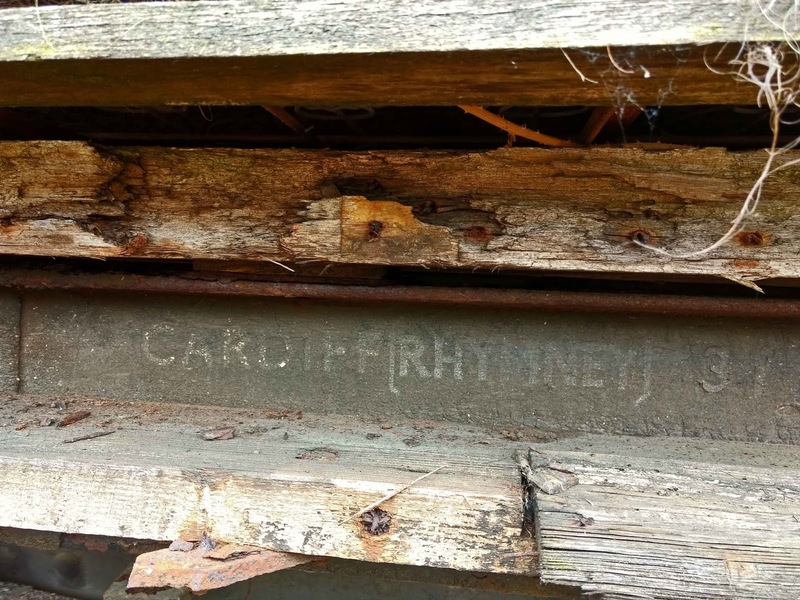 Those concrete sleepers with solid base plates on them are quite heavy, and today somewhat outdated. 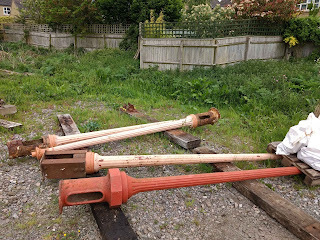 But they are still good for sidings, so we will store them on the other side for future use somewhere. Here's a neat stack of 8, which Dave is about to pick up and run round to the other side of the yard, where we rearranged those lamp posts. We also threw on a few chairs and fishplates that were lying about that part of the yard, it all looks a bit neater now. 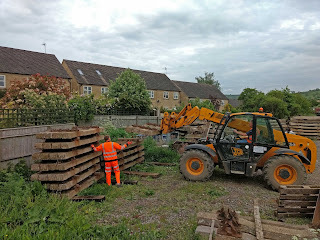 And this is where they all went: two big piles of concrete sleepers with Pan baseplates. Siding quality, mind you, most have some sort of issue. It arrived at last! It really is quite big, don't you think? Here it is on the back of the Allelys low loader, just rolling past the Toddington station building. As the Allelys guys take off the chains, it gets an appreciation from 3 volunteers. More importantly, Mrs Blogger approved of the colour. It's a nice blue, she opined. So that's alright then. We can proceed with borrowing it. 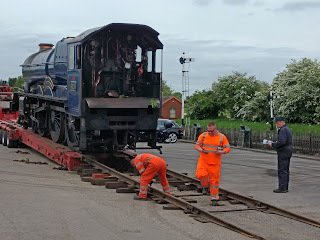 Some last minute adjustments to the temporary road, as the heavy locomotive starts to roll down the slope. Leading lights of our locomotive dept came to see the loco finally touch down on good, Cotswolds soil. And here she is (or he? It is a King), safely installed outside the loco shed. The tender was not far behind. The Blue King at Toddington - don't fail to see it during our steam gala. 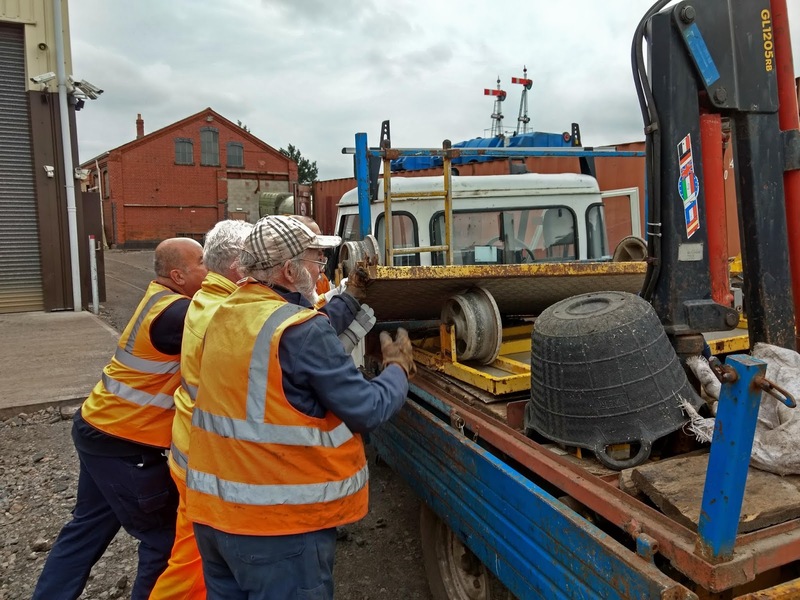 This loco had half a wheel cut off at Barry, yet here it is, ready to pull our 8 coach trains. It just goes to show that you can do anything if you really want to. New cylinders for the Duke, a cutting excavated of household waste, a North Wales narrow gauge line completely relaid, a new Peppercorn pacific built from scratch - we can do it ! 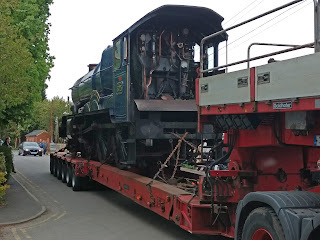 News reached your blogger of a steam excursion going down Honeybourne bank yesterday, a stone's throw from his house. This he had to see. On yer bike, mate, and take a look over the fence. 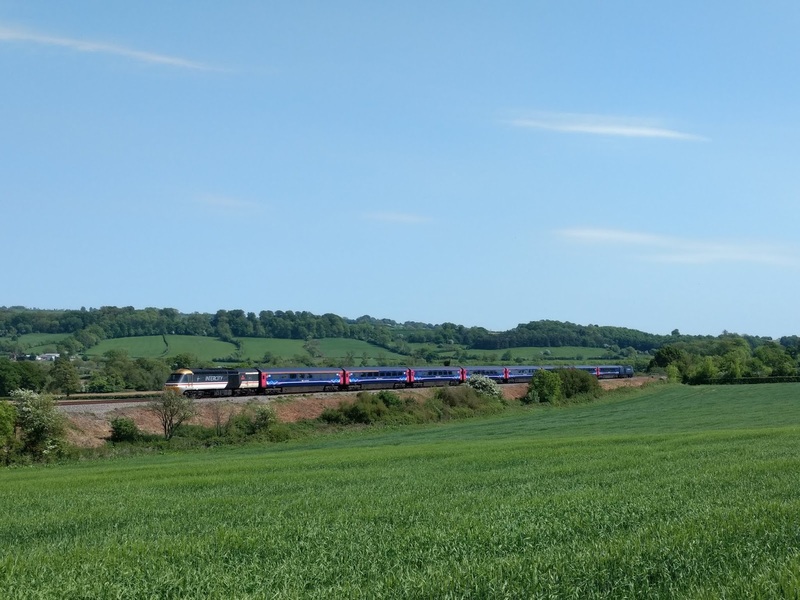 Why do all the steam trains go down Honeybourne bank? This is the third one we have seen going downhill, and none back up. As we saw this Hitachi IET climb the hill, we heard a former Oxford fireman, also on the overbridge here, tell the story of how he fired a 9F up the bank. Maximum pressure at the bottom, and a full fire. He shoveled coal in to the firebox as fast as he could., all the way through the tunnel and to the top at Campden, but when he got there, the firebox was half empty. They had diesel bankers at the end, but sadly the need for them disappeared, as did the trains for them. Times change. At least we got our double track back. 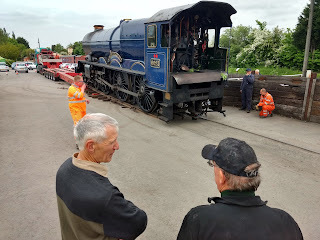 And we still have a genuine Honeybourne fireman at Toddington. He's going to have a go at the King too! According to the full description, with photos, on the Vintage Carriage Trust web pages (see http://www.cs.vintagecarriagestrust.org ) the two carriages are :- GWR 5539 5-compartment Collett Brake Third built 1928 and GWR 5500 Brake Third built 1934. 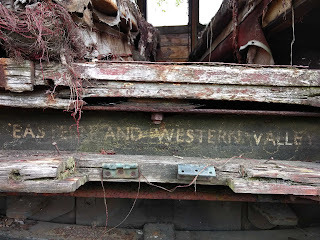 There is also a history there of the 2 carriages during their 'preservation'. The significance of these two is that they are non-corridor. 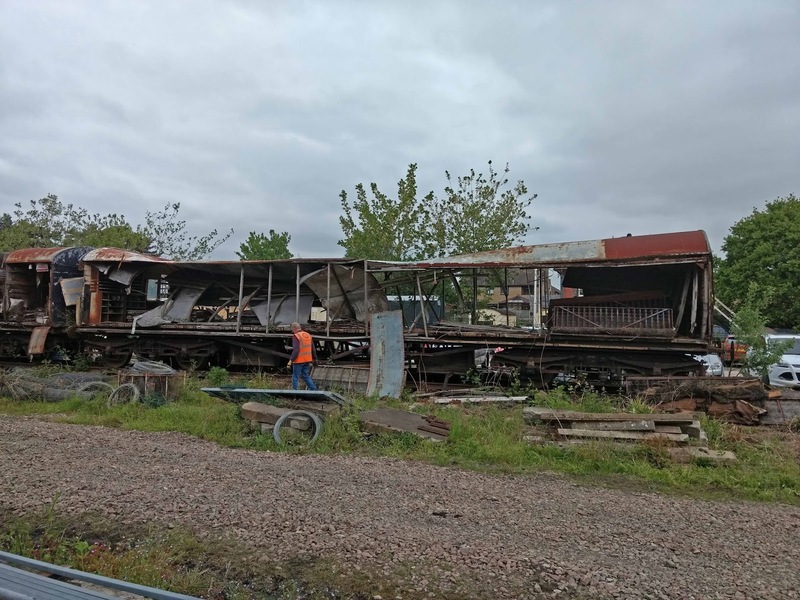 Were they to be restored (I suppose the frames and bogies will have survived OK), they would be uniquely able to portray a genuine 30s GWR suburban train, or at least part of one. There are templates of how to do this in preservation, on the SVR. 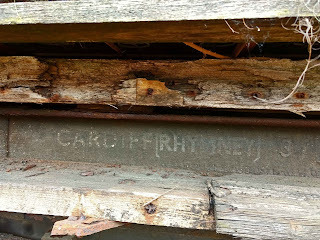 Used to convey coal miners in the valleys? 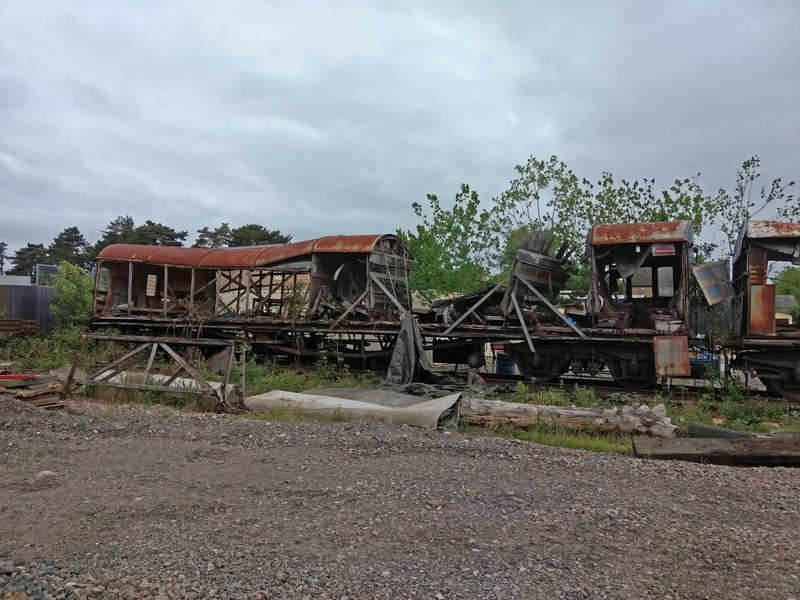 I believe they were the first operating coaches on the formative Llangollon Railway, tragic that what were once such important vehicles (note past tense) have been allowed to deteriorate to this state. The SVR are indeed the flag bearers for this sort of thing, and even they have taken 10 years or so to restore coaches much less decrepit than these. Unless it's done by their team there working flat out, it's going to be decades a best before these coaches are fit for passengers. The 2 heaps of scrap which form a temporary blot on the Winchcombe landscape are unique examples of their type and a good example of what can happen if rolling stock is left outside unattended for a while. They are probably both restorable. Foolish millionaires step this way please! Maybe they are in theory restorable, but please can they be put out of sight (or out of their misery)? Things like this ruin the impression of a tidy well-run railway. I'd guess any restoration will take years if it happens at all. 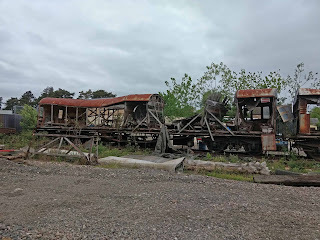 As it says in the blog, these 2 "coaches" are due to move off site soon. Perhaps they should never have been allowed on site to start with but, hindsight....etc. They are stuck where they are, being on an unconnected length of track. 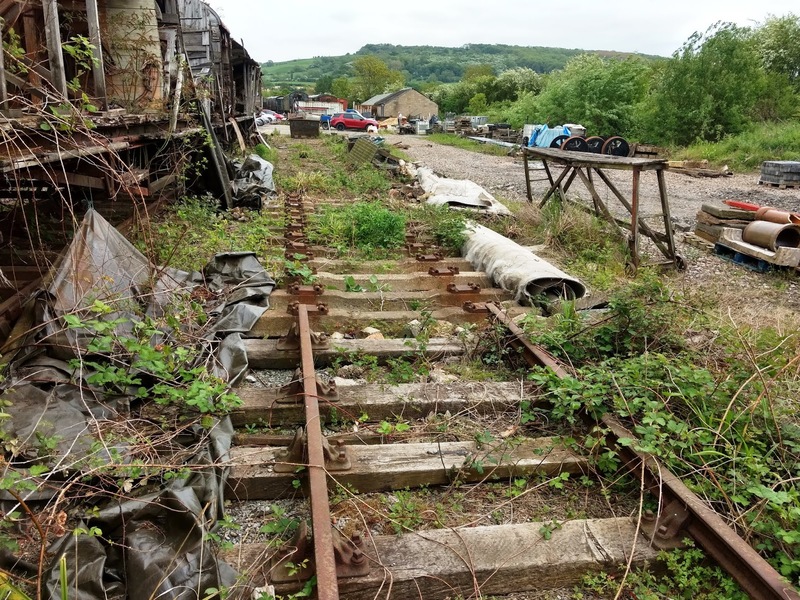 At least some of them (2 out of the three sidings there) have gone. Patience ! I know it didn't, but if we keep on saying "soon" often enough, it might just happen! 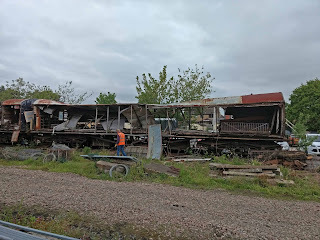 Never mind the decaying carriages (although I too would like to think they had a future), should have been restored by the owners long before this! The King looks absolutely FANTASTIC! The blue colour DOES suit it (ducks to avoid things being thrown at me by GWR purists)! What a wonderful looking engine. Can you keep it? (said hopingly). Interesting blog, especially with Black 5 video. 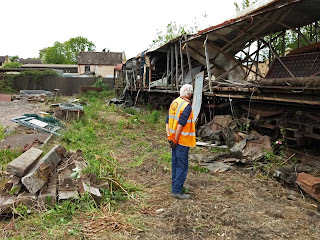 good cop Joe on the Black Five , these coaches are a blot on the landscape and must go , just like the awful DMU's visible at Toddington which visitors see after departure .Board have asked for their removal inside the sidings but that was 6 weeks ago. Hope they are out of site before next weekend .john M.
Absolutely! If you drink enough pints then heaps of scrap start to take on more attractive forms. 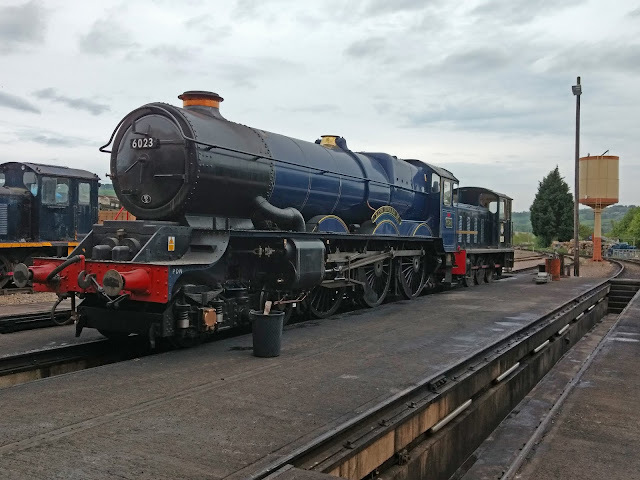 Joking aside, I'm looking forward to seeing KEII next Saturday at the GWSR. 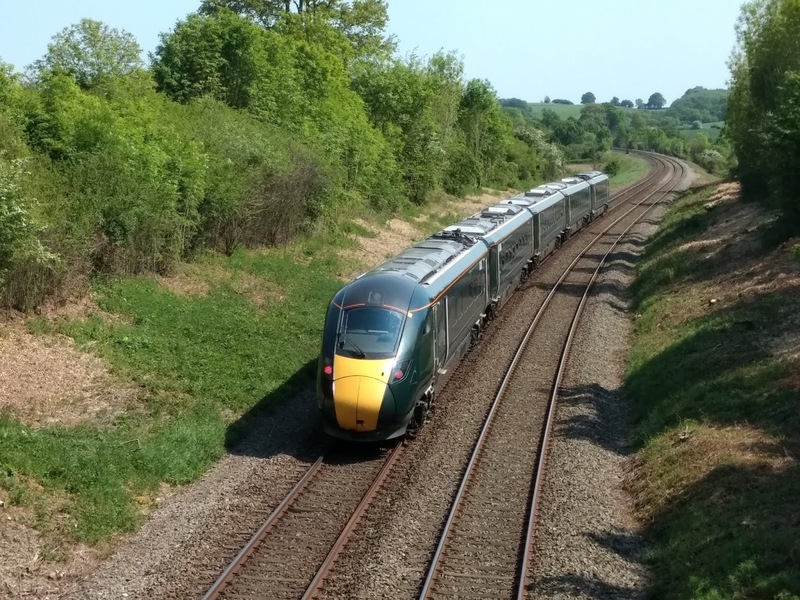 Not a type ever seen on the Honeybourne Line, it will be quite a sight, I'm sure. I don't think any haulier will move those carriages and somehow I can't see the owner making them fit to move in hurry, if they've left then to get in the state they are in. Their best future might be as donor underframes for a couple of surviving grounded bodies.